Product prices and availability are accurate as of 2019-04-18 11:50:56 UTC and are subject to change. Any price and availability information displayed on http://www.amazon.com/ at the time of purchase will apply to the purchase of this product. 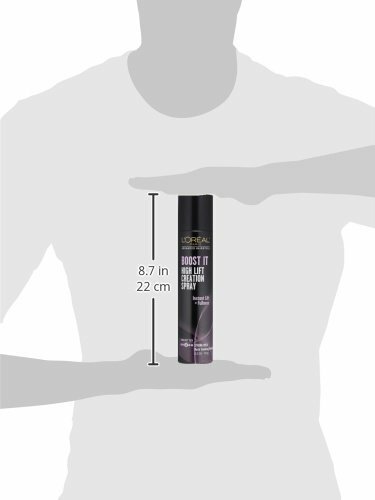 L'Oreal Paris AHS BOOST IT High Lift Creation Spray is a high-performance finishing tool now at your fingertips. Get targeted root lift and a full hairstyle with our unique fan spray. This hairspray boosts fine hair and adds body to any style for a voluptuous, textured look that lasts. • Instant Lift • Back Combing Finisher • Strong Hold • Full Hairstyle with Body Spray 8-12 inches from dry hair to BOOST IT and texturize for all over fullness. Or spray directly on roots for targeted high root lift. For amplified lift and fullness, use a comb to tease the hair. The perfect finisher for your style. Flammable. Avoid fire, flame and heat during application and until hair is fully dry. Avoid spraying in eyes. Contents under pressure. Do not puncture or incinerate. Do not store at temperatures above 120ºF (49ºC). Keep out of reach of children. Use only as directed. Intentional misuse by deliberately concentrating and inhaling contents can be harmful or fatal.